The vehicles on our roads come in all shapes and sizes and include cars, bicycles, pedestrians, horses, mobility scooters, vans, trucks and buses. From the largest to the smallest, each has a right to be there. This size difference means we need to pay special attention to each other and make travel safer by sharing the road. 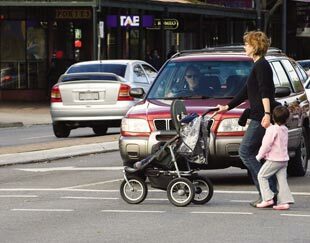 Nearly one in every seven road deaths in South Australia is a pedestrian. In addition to fatalities there are on average 71 pedestrians seriously injured many more who receive minor injuries each year. Drivers can help make roads safer for pedestrians by scanning for pedestrians at crossings and intersections, and being aware of the potential presence of pedestrians affected by alcohol around entertainment venues and during festive seasons. Drivers should slow down where there is a high amount of pedestrian activity and remember that older pedestrians and those with disabilities may need extra time to cross a road. Drivers must give way to pedestrians on the footpath when entering or leaving a driveway or other road related area. If a driver is turning left or right, the driver must give way to any pedestrian at or near the intersection on the road, or part of the road the driver is entering. Under the law, mobility scooter users travelling under 10 km/h are pedestrians. get into the habit of always using your mirrors and doing a head check before opening your car door. One way to do this is to open the car door with your left hand. Originating in the Netherlands, the Dutch Reach method of opening a car door with the hand furthest from the door handle means that drivers are forced to turn their body towards the door, allowing them the opportunity to look over their shoulder to see whether a cyclist is coming past. Passengers on the left hand side of the vehicle should use their right hand to open the door. The Dutch Reach is a good way of opening a car door and looking behind you for bicycle riders or other road users. remember that bicycle riders can legally ride two abreast, so be patient as you approach and overtake only when safe. Many bicycle riders are badly hurt when drivers open car doors without looking properly, so take care when opening your car door and look out for bicycle riders. Picture courtesy of David Cronin. Whether you are riding in a marked bicycle lane or sharing a lane with a vehicle, a bicycle rider must not pass or overtake on the left of any vehicle that is giving a left change of direction signal and is turning left. A driver turning left through a break in a dividing strip must give way to any bicycle rider travelling in the bicycle lane. A dividing strip is a painted area or a raised structure, located between intersections, separating the bicycle lane from a marked lane. Drivers must not overtake a bicycle rider and then turn left in front of the bicycle rider's path without due care and consideration to the movement and safety of the bicycle rider. not throw objects or shout at a horse or rider. Motorcyclists, including scooter riders, are over-represented in road trauma. They are nearly 30 times more likely to be killed or seriously injured than other vehicle drivers for the same distance travelled. In South Australia motorcycles make up 4% of registered vehicles and account for 14% of fatalities. Because motorcycle riders are less protected than car drivers, they have a greater chance of being killed or injured in a crash. The law requires all motorcyclists to wear helmets and they should also wear protective clothing, particularly with bright colours to make them more easily seen. Riding with headlights switched on can also improve motorcyclists' safety. Riders who use daytime running lights increase the chances of other road users seeing the motorcycles approaching. Drivers can help make roads safer for motorcyclists, in much the same way as they do for cyclists, by always checking what is in front of their vehicle, behind it and to each side. Always leave plenty of room if overtaking a motorcyclist. More information can be found on Road Rules and motorcyclists and licensing for motorcyclists.